"Sonic the Hedgehog...Caught Between a Rock and a Hard Place!" 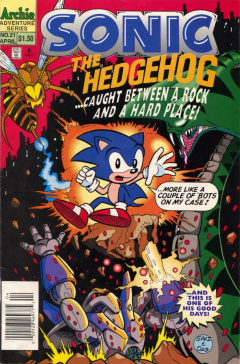 Sonic the Hedgehog 21 is the twenty-first issue of the Sonic the Hedgehog comic series. It was released in April 1995. This comic features one story: 3 Phases of E.V.E..
Robotnik's Swatbots are at it again, trying to attack Sonic the Hedgehog. Like always, Sonic takes the upperhand and easily disposes of the robots. Continuous waves of Swatbots continue on Sonic, but they are taken care of with no hassle. Meanwhile, Robotnik himself is watching the chaos ensue from his office, commenting well on the situation. His nephew, Snively, however notes that his forces are being slaughtered. Robotnik states that this mission is purely for fact-finding, and that each Swatbot destroyed brings up more data on Sonic, as he shows a printer printing data continuously. As Sonic finishes dealing with the Swatbots, Robotnik takes a look at some of the data, noticing that everything he needs to learn about Sonic is there. He orders Snively to grab a load of the data papers and to join him on his next project. With piles of paper in hand, they arrive in Robotnik's cyber-mechanoid design facility: a large room with a cylinder in the middle full of a liquid. They walk over as Robotnik introduces the fluid object in the cylinder as E.V.E., or exceptionally versatile evolvanoid, which can adapt to any situation, with sub-microscopic components that are indestructible. He inputs the data sheets into E.V.E. 's cylinder's computer to learn. With a bright flash of light, E.V.E. learns the perfect manner to dispose of Sonic - permanently. Back in the Great Forest, Tails walks with Sonic, commending him for disposing of the Swatbots. He notes that Robotnik must be scraping the bottom of the barrel, and that disposing them was too easy and boring. He wishes Robotnik would come up with something new, just as a large mechanical hand pops out of the ground behind Sonic. E.V.E., in the form of a pink humanoid robot, appears and punches Sonic easily, throwing him a far distance. It then uses one of its hands as a machine gun and fires at Sonic, but can't keep up with him. Realizing that it may be too quick to judge, he stands infront of a tree and taunts E.V.E.. It fires as he jumps away, making the robot destroy the trunk of the tree, causing it to fall right on it. With the robot disposed of, Sonic and Tails decide to continue on to Knothole Village and ask Rotor about it to determine what exactly it was. Snively and Robotnik watch the defeat of E.V.E. from his lair, but Robotnik doesn't declare defeat. He accesses the computer terminal and tells Snively that E.V.E. has brain cells from him, and cells from Sonic from a quill plucked earlier. With both components, E.V.E. has the intelligence, craftiness, and superiority complex of Robotnik, and the resourcefulness of Sonic. With these traits in place, the destroyed E.V.E. transforms into a silver goo and reforms. Continuing on, Tails hopes that that robot was one of a kind, until he hears a loud buzz. Sonic looks back to see E.V.E., now in the form of a large wasp, swooping toward the two. It fires a laser from its stinger, just as the two jump from the blast. They continue to run along the path as the wasp follows, firing lasers from its stinger. Despite the different form, Sonic is suspicious that this robot may be the same as before. The two Freedom Fighters run as fast as they can, noting the wasp is faster than the other robot, but want to use this speed to their advantage. They approach a cliff and quickly run up it. The wasp can't react in time and slams into the rock wall of the cliff. They stop at the top of the cliff to assess the situation, only to watch as E.V.E. reforms again, realizing they are, indeed, the same robot. They decide to go directly to Robotropolis and get a explanation to this robot. In Robotropolis itself, Snively notes the second loss to Robotnik, but he shrugs it off, saying that no matter how many times E.V.E. is destroyed, it'll reform and learn. Suddenly, Sonic appears in a flash in Robotnik's lair. Robotnik makes an off mention of E.V.E, which makes Sonic curious. He informs Sonic that they have met E.V.E, many times...just as the reformed E.V.E., in the form of a giant cobra, crashes into the building. Sonic tries to run, as Robotnik watches in glee, but can't escape and gets caught in the tight grasp of the cobra. He laughs as he gloats that E.V.E. will not stop until its programming is fulfilled. Stuck in the grasp of the cobra, Sonic devises and idea and enters into a spindash, allowing him to pop out of the hold. He rapidly hops around the bot, causing it's body to get entangled in a big knot. He gets down and gloats to Robotnik of his victory, but watches as E.V.E. reforms yet again. Robotnik decides to gloat for himself as E.V.E. cannot lose, but can only improve. He introduces E.V.E. as it enters into its final phase: to surpass its own limitations. It develops into large speaking robot, composed of many tentacles attached to a head-like structure. It states its name and purpose, to surpass its single greatest limitation: Dr. Robotnik. Realizing his creation has turned on him, he tries to reason with it as he gave it life and a purpose. It telepathically grabs Robotnik as he tells him that with Robotnik's cells, it received evil, but the cells it received from Sonic allowed it surpassed those feelings. It throws Robotnik into the wall as it states that he not only received resourcefulness from Sonic, but the ability to think for itself and to use logic. With that logic, E.V.E. realized it did not have to be Robotnik's servant. Robotnik, meanwhile, takes out a laser gun and fires at E.V.E., but the shot is repelled from a shield formed by it. E.V.E. then fires a powerful laser blast from its eyes, encapsulating Robotnik in an energy field. He disappears, leaving a small smoky mark where he stood. With E.V.E. 's task fulfilled, it now must complete its programming: by destroying Sonic the Hedgehog. Sonic stops E.V.E. before it can do the same thing to him as Robotnik, but getting a few things off of his chest. He tries to remind E.V.E. of what Robotnik told it earlier, that it was designed to surpass its own limitations, but the limitation wasn't Robotnik, but its own programming. Until it can do so, it'll never be able to accomplish what it can do. E.V.E. contemplates his statements, and believes Sonic. Without Robotnik, it has freedom of choice. It flies away into space, thanking Sonic for what he said. Now it is free, and it can be itself. Tails and Sonic watch as E.V.E. flies away, leaving Tails astonished that Sonic's idea worked. He wonders if it'll ever come back, but Sonic feels that they can take care of that when the time comes. However, with Robotnik gone, that leaves Tails with many questions as to the future of Mobius. While in the middle of their thought, Snively, aside, yells at them to leave. They decide to head out and tell the others of Robotnik's defeat, leaving Snively alone with his thoughts in the ruined lair. This issue introduces E.V.E., or Exceptionally Versatile Evolvanoid. It will return in future issues of the comic. This is the first cover of the regular Sonic the Hedgehog comic series drawn by Patrick Spaziante. A photo of Mother Robotnik is visible on Robotnik's desk. E.V.E. 's reformation is similar to that of the T-1000's regenerative abilities from the Terminator series of movies.